Public outrage is easy to come by these days. Whether it is signing a petition to remove a statue from the public view, complaining about a store ad being too gay or just clicking on a Facebook page to support or condemn some cause, expressing your views doesn’t even require a trip to a mailbox anymore. And while some comments on these sites and petitions look angry and radical, these people should stand back in awe of the original masters of public character assassination and manufactured outrage – the Soviet Press. 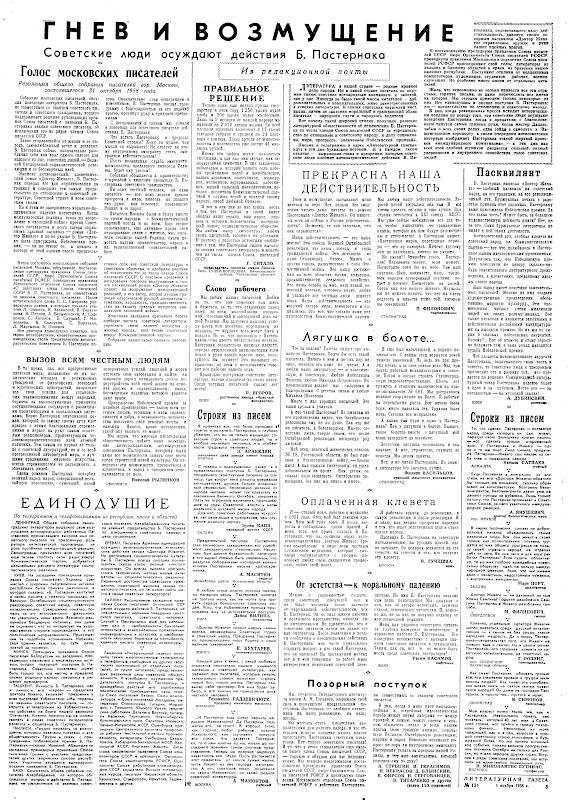 The following page was published in the Soviet Literaturnaya Gazeta (Literary Newspaper) on November 1st 1958. In this issue various writers, artists, organizations, and even regular Soviet citizens expressed their outrage with the actions of Boris Pasternak, the author of Doctor Zhivago, who was awarded a Nobel Prize for his anti-Soviet novel. Famous Russian joke “I haven’t read Pasternak, but I condemn him” was extracted from one of the letters on this page. I translated a few letters and articles, clicking on the page should provide a decent readable copy. Resolution from the meeting of Moscow writers conducted on October 31, 1958. The meeting of Moscow writers discussed the conduct of B. Pasternak incompatible with the title of the Soviet writer and Soviet Citizen, wholeheartedly support the decision of the leadership of the Writers’ Union to remove B. Pasternak from the ranks of the Soviet writers and purge him from the Union of the Soviet Writers. Long removed from life and people, a narcissistic aesthete and decadent, B. Pasternak finally revealed himself as an enemy of the most sacred to all of us, Soviet people, – The Great October Socialist Revolution and its undying ideas. In writing an anti-Soviet, slanderous novel “Doctor Zhivago” and later smuggling it abroad for publication, B. Pasternak betrayed the Soviet literature, Soviet country and all Soviet people. But this didn’t stop the moral and political downfall of the slanderer. When the world’s reactionaries started using the dirty rag – the novel “Doctor Zhivago” as a weapon in their Cold War against the Soviet State and the entire Socialist Camp and when on their orders B. Pasternak was awarded the Nobel Prize, he didn’t reject it. Instead, he became elated with this assessment of his betrayal. This degenerate derelict and a traitor sent a telegram thanking the enemy for his thirty pieces of silver. We were disgusted and outraged to discover shameful deeds of B. Pasternak. What could Pasternak do in the Soviet country? Who needs him, whose thoughts does he express? Maybe this internal emigrant should become a real emigrant? Let the unenviable fate of this emigrant and cosmopolite be his punishment! The meeting calls on the government to strip B. Pasternak of the Soviet citizenship. No honest person, no writer, no one who cherishes the ideals of peace and progress, will ever shake his hand, as a person who sold his Motherland and his people! Moscow writers will always be with their people, with the Communist Party, in everything and at all times. With our ranks even tighter, with our unbreakable ties with life even stronger, we, the writers of our Motherland’s Capital, will be helping the party, the government, and the people in their magnificent creative work. Our collective farm alone sold 1, 250 thousand poods of wheat and 200 thousand poods of other grains. In just 9 months we milked 2, 070 liters of milk from each cow. We harvested on average 24 centners of grain from our 17 thousand hectares. Our income from farming and cattle already reached 41 million rubles. Some people may find these numbers boring, but to us they sound like a great symphony. These numbers encapsulate previously unheard of victories of our farmers; cattle farm personnel; engineers; veterinarians; mechanics and our village intelligentsia who was brought up by the Communist Party and serves its people and its beloved Motherland. And in these days we are hearing the news about Pasternak and his book slandering our country, our people, who were the first in the history of mankind to create the new, socialist society. We love our literature, we love our writers, we are proud of their successes. That’s why we were happy to see the announcement about Pasternak being expelled from the Union of the Soviet Writers and denied the honorable tile of the Soviet literator. The Chairman of the V.I. Lenin Collective Farm. Village of Gulyai- Borisovka, Mechetinsky County, Rostov Region. I’ve read everything that was written in the newspapers about Pasternak’s novel and I am deeply convinced that he doesn’t only hate the Soviet order and the Soviet people, but hates the humanity in general, especially the working people. Department manager in the Kirov Factory. I was outraged and angered to find out about the traitorous deed of B. Pasternak, who sold his dirty slander abroad, where it was made into another anti-Soviet sensation. Only a person far removed from the people, blinded with hate, can smear the achievements of the Great October, and close his eyes on the great changes that happened in the years of the Soviet power in the material and spiritual life of the people. For us, the workers of the art, there is no higher and more beautiful purpose, than serving our people. What happened? Newspapers write about some Pasternak. As if such writer exists. Until now I’ve never heard of him, never read his books. And I love our literature, classical and Soviet. I love Alexander Fadeyev, love Nikolai Ostrovksy. Their works make us stronger and more honorable. Since my childhood I read and love Mikhail Sholokhov. We have many good writers. They are our friends and teachers. And who is Pasternak? Judging from the quotes from his novel it’s obvious that he doesn’t favor the October Revolution. So he is not a writer, he is a White Guard. We, the Soviet People, know that after the October Revolution, the humanity rose up. My father, famous cattleman on the collective farm #18 in Rostov region, did not get drafted during the Great Patriotic War, he was exempt. But when the Germans pushed on, he volunteered. He even said to us kids: I have to defend the October achievements, we are nobody without them. I was still a boy but understood it well. Father returned from the war heavily wounded. But he didn’t spill the blood in vain; it was for the right cause. We, three brothers, worked on the collective farm. Then I went on to build the Stalingrad hydroelectric power plant. For the past 6 years I work as a senior operator of the crane-excavator #681. We are finishing the great project on Volga. I work on building a dam. It stormed overnight; there is a lot of damage. It was a difficult night, but today everything is repaired. But what kind of storm is in the Pasternak’s puddle? Like a frog in a swamp. Sometimes my excavator just picks up a small swamp together with a frog and throws it away. Frog may be upset and he croaks. But as a builder I don’t have time to listen to this. We are busy. No, I didn’t read Pasternak. But I know, the literature is better off without frogs.